BallyCara’s SONA™ approach is a proven methodology for individualised care and services which was created in 2011 in response to a review of the organisation’s unique lifestyle philosophy. SONA™ is Gaelic for Happiness, reflecting BallyCara’s Irish heritage and the BallyCara’s commitment to inspiring healthy and happy living. Embrace: We have a passion for information and love of wisdom, building in-depth knowledge of our residents’ unique backgrounds, and pursuing a continuing investigative journey in our engagement with them. 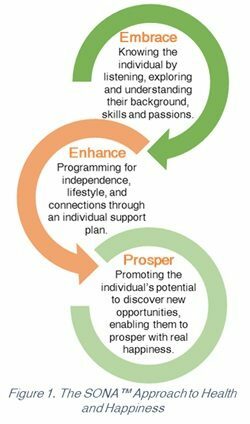 Enhance: Individualised assessment and supported programming based on their passions, strengths, and abilities. Prosper: Inject motivation, energy, and hope to ensure progressive happiness, realised potential, and ensuring the individual’s purpose is met. SONA™ consciously positions and prioritises ‘happiness’ as the central organisational goal. SONA™ has been a focus for ground-breaking research over the past four years made possible by an Australian Research Council grant in partnership with Queensland University of Technology. The research findings clearly demonstrate the benefits through the adopted service methodology for individuals and their families as well as positive outcomes for the provider organisation in terms of workforce, market share and delivery on mission and vision. This research into the impact of SONA™ encompassed our Village residents (Independent Living) and relatives, Home Care clients, Wellness customers, and Residential residents and relatives. Significant outcomes were experienced for the range of clients, as illustrated in Figure 2. 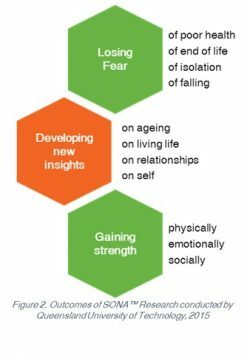 Incidence of depressive symptoms decreased to 18.2%, in residential aged care delivering SONA™ (Compared to 52% of all permanent Australian aged care residents). Leads to higher job performance, satisfaction, and morale of front-line service staff through delivering SONA™. SONA™ resonated strongly with staff individual motivations for working in aged care. The application of SONA™ goes beyond enhancing the day-to-day lives of residents, leading to enriched care practices. Ageing populations around the world provide us an unprecedented opportunity to make a positive impact in the lives of more senior citizens than ever before. As part of an international SONA™ professional community, the BallyCara Institute will support your organisation, with ongoing access to our expertise, and sharing best practice with a range of organisations committed to reimaging the ageing experience. SONA™ is a unique approach and commitment to fulfilling organisational purpose, which means you’ll be company with some of the best in their class. The SONA™ brand is therefore a signal to your clients and families that you go beyond the basics, and see the whole picture of healthy and happy ageing. SONA™ also incorporates the United Nations Principles for Older People (1991) calling for commitment to actions supporting independence, participation, care, self-fulfilment, and dignity for older persons. Furthermore, SONA™ fulfils the WHO (2002) Active Ageing call for ageing to be a positive experience accompanied by continuing opportunities for health, participation, and security. BallyCara is committed to reframing ageing in Australia and beyond, with a mission to “inspire healthy and happy living across generations, be a catalyst in the lives of our friends, and build communities where age is no barrier”. 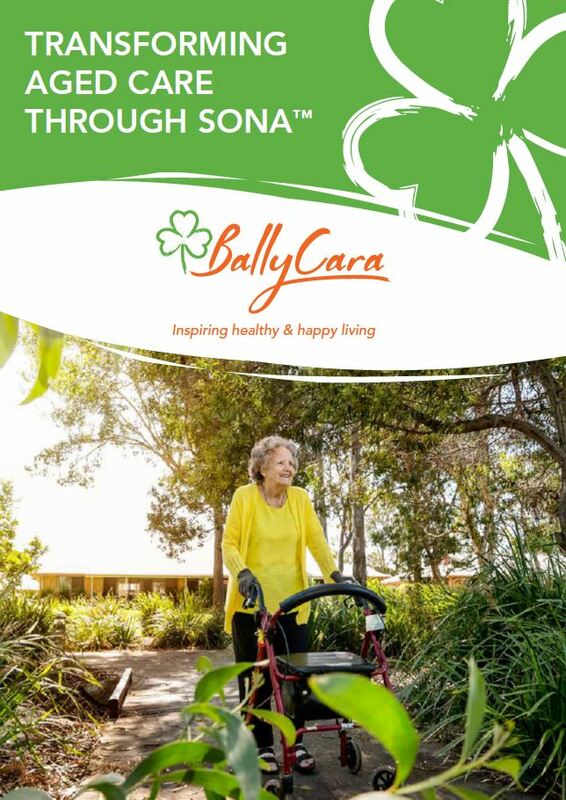 Our research and association with Queensland University of Technology have highlighted BallyCara as a positive example of active ageing, and the important role of our SONA™ approach. Recently, BallyCara Villages was recognised as Australia’s Happiest Retirement Community. BallyCara has earned international recognition as a leading provider in the ageing industry providing services on a local, national, and international basis. Our executives hold senior leadership roles in several national and international aged care associations and federations, including the Global Ageing Network and the Leading Ageing Services Australia, and are regularly sought as inspiration for international conferences and gatherings. I have nothing but praise for the wonderful staff especially the people who helped care for my grandma.